The Feloid officer ran down the hallway as fast as he could. He had been given horrible news and he had the unfortunate task of giving the information to Mundis Ty. He reached the large doors that lead to his leaders chambers and saluted the Royal Guardsmen that were standing sentry there. “I have important information for Lord Mundis Ty that can not be delayed.” The officer said holding up a black envelope. One of the Guardsmen went inside quickly to tell his Lord about the message. He ran across the main hall almost knocking down one of Mundis’s cat girl servants. He made his way down the long hallway and up the grand staircase to the bedrooms. Once at the end of the hall he notified one of the guards at the door of his bedchamber about the message. The guard at the door opened it and went inside. He went to the balcony and grabbed one of the cords and pulled it back letting the morning sun into the room. The rays hit the bed like a spotlight causing Mundis to groan loudly. “What? What is it?” he growled angrily as he sat up covering his eyes with his arm. “A messenger downstairs My Lord. He has a black envelope.” The door guard said. “Yes My Lord.” He said. “Damn it to blazes!” he yelled and rolled out of the huge bed leaving his two cat girl concubines dazed and wondering what could have him so agitated. Mundis hurried to the door as one of his servants tossed him his robe. He put it on as he ran down the hall accompanied by the guardsman that had been guarding the main door. They made their way down the stairs and along the main hallway. Mundis saw the messenger standing in the doorway holding the black envelope. He made his way up to the officer and stuck out his hand so he could be given the packet. They both noticed his hand shaking as he reached out but they both pretended they hadn’t seen it. Mundis turned his back on the officer and read the dispatch inside. His knees failed him and he collapsed onto the floor. “Lionette and her soldiers have been ambushed on Tarsis station…there are no survivors.” Mundis said to the guard that had been at the door. “What are your orders My Lord?” he asked helping Mundis to his feet. “This wasn’t supposed to happen. She was to be the leader of the Clan not me. She was the oldest. I was just the one that made the others laugh…the jester. I can’t do this!” he said panicking. “May I suggest you call The Colonel to your chambers My Lord? The Lady Lionette held great trust in his council.” The guardsman asked. “Yes…the Colonel. He’ll know what to do. Have him brought here at once!” Mundis said almost yelling. The officer saluted and took off down the hall. Mundis stood rigid, almost courageously for a moment before he stumbled over to a chair and collapsed into it. Lionette had always been the one that had been trained to be the next Clan leader. She had training, experience and respect. He had always been faithful to her but he had always made it clear to every one that he had no interest in the leadership role, partly because he didn’t want to be seen as a threat too her and partly because he enjoyed the more lurid advantages of his station. It was never made public but Mundis had over a hundred cat girls catering to his every whim. This attack could mean the end of the Clan. Without a strong leader the home world was vulnerable to invasion by another Clan. It was Feloid tradition that when a Clan’s leadership became weak it would be challenged by another Clan for the right to exist. Mundis knew he would be challenged in time and he also knew he wasn’t a strong leader. The Colonel was his only hope. He had been the most trusted advisor his father had and was also highly regarded by Lionette. Mundis had decided to do whatever the Colonel told him to do. It was his only option. Matt left the ship followed by Kang. He stopped and sat on the front landing gear of the freighter and looked at the empty area next to his ship. That’s where Ragg’s ship should be right now. He ran the mission through his mind a thousand times and couldn’t figure out how the Empire could have found out about his plans. It couldn’t have been anyone on the mission since his ship was as much at risk as Ragg’s was. It was just dumb luck that he was here and everyone on Ragg’s ship was gone. He hadn’t told anyone about any of the details until they were underway. Even the new fighter squadron only knew they were supposed to meet them at the rendezvous spot and only then would they get their destination given too them. “Matt!” it was Pep. She came running from her workstation noticeably glad to see him. He stood to greet her as she slammed into him almost knocking him down. She had thrown her arms around his neck and pulled him tight. She didn’t care what anyone thought. She was just glad he was alive. Matt had radioed back a few days ago what had happened so it was a sad home coming to say the least. “What happened?” she asked still holding tight. “We got ambushed. The Imperial Frigate new where we were going to be and when. Somebody leaked the information to the Empire. Ragg, Ceecee, and all the rest never stood a chance.” Matt said sadly. “Could it have been someone in the new squadron?” she asked. “The Empire used some new weapon on them. They were all destroyed…everyone of them.” Matt replied. “What will happen now?” Pep asked. “We have to find our leak before we can mount any new missions. We also need to find out if they took Ragg and any other survivors prisoner. If they did then we have to try to rescue them.” He said. Pep hesitated and looked down at the floor. “Are you sure Ceecee’s gone…I mean maybe she was with Ragg.” She asked hoping. “Ragg’s the one who told me she was dead. I’m sure it was quick.” Matt said. They held each other in their arms just enjoying these fleeting seconds together. “Matt!” Kang yelled from across the hangar. He was motioning to them to come quickly to the command building. Both Matt and Pep realized the urgency in his voice and ran across the hangar floor as fast as they could. The Feloid engineers and hangar crew along with the Rebel troops all began to hurry to the door where Kang was standing. He was holding up his hands trying to silence them. “Attention! Fall in!” Matt yelled. The Rebels, hearing Matt’s voice fell into rank followed by the Feloids. “Lionette Ty has been killed along with a large detachment of her personal guard on Tarsis station. They were ambushed by Sith assassins. We don’t have all the details yet or her body but the assassins used plasma weapons so identifying bodies will take some time.” Kang said forcing himself to remain in control. “Was Neeka with them?” Pep shouted. Kang nodded yes. Even his Reptus face showed remorse. Pep covered her mouth and wept. All she could think of was Neeka’s child. “Who’s in charge?” Matt yelled knowing the answer but afraid of the answer. “Mundis Ty is in charge now and leader of the Ty Clan.” Kang announced. There was an awkward silence even from the Feloids. “Long live Mundis Ty!” Matt yelled. A chorus of “Long Live Mundis Ty” erupted in the hangar sounding almost convincing in its enthusiasm. Lionette sat fastened to a chair that had the restraining devices built into it with her head secured by a metal band to the high back. She had been blindfolded and a gag was stuffed into her mouth. There was some minor relief after she felt her nightdress was still on and she had some modicum of clothing to cover her. Her head ached and she felt cold. Her captors must know that Feloid Royals are all trained in escape techniques and that if they had used ropes she would have been free in minutes. She was a prisoner and she was alive. This meant she still had value for now. Why would the Sith care if she lived? Their goal was to destroy the Feloid Clans so it would make sense for them to kill her and not risk her escaping. She instinctively began to struggle against her bonds. This caused a small bell to ring that had been attached to the chair. She suddenly realized this was a Feloid punishment chair. It was considered barbaric on Ty worlds and Lionette had only heard about them in stories of days long past. If the girl confined to the chair moved it would cause the bell to ring and then she would be punished by a few lashes from a whip or some other torture. She stopped moving hoping her captors didn’t hear the bell. For the first time since she was a child she began to feel fear. She was helpless and had no idea what her situation was. Lionette sat quietly trying to hear anything she could that might give her a clue to her location. She knew her Jedi teacher had known of ways to sense ones surroundings and even other people that were near. Of course that was all primitive superstition and fairy tales but right now she was wishing she had been taught those disciplines as well as the Jedi combat techniques. The gag was drying out her mouth and it was causing her to cough. Each time she felt a cough coming on she would brace herself against the chair and try to control it as best she could to keep the bell from ringing. It had been a long time since she woke up and still there had been no sign of anyone coming to get her. The fear was slowly becoming boredom punctuated only by the cramping in her muscles from being locked in on position. She had inadvertently rang the bell at least four times in that period. This made her think she wasn’t there to be punished. The chair was only a device to keep her from escaping. More time passed as she sat there alone blindfolded. Lionette tensed up as she finally heard a faint sound. It sounded like a door opening in the distance. She heard the sound of heavy footfalls on a stone floor getting closer. Soon they were very close and she heard a door open and a gust of air blow over her. violent surge of electricity that crashed through her body. It lasted at least fifteen seconds causing her body to spasm uncontrollably in her restraints. Once the pulse stopped she coughed and choked on the gag as she gasped for air. The second pulse had the same results with the indignity of her wetting herself. “You like that?” asked a male voice followed by a third pulse of electricity. “I saved you for myself Lionette Ty. Your father took everything my father had so now I’m helping the Visiok clan take everything you have. At this minute his fleet is moving up to the border for an all out invasion of Ty space and your home world of Ty Prime. In a day or two everything you ever loved will be gone.” Torbarr said pulling off her blindfold. “The funny thing is you don’t even know who I am. You’re looking at me wondering why I’m doing this aren’t you? Well the short version is this; your father took my fathers stuff so I found a bigger and badder group to take your stuff. The only thing you have to worry about is yourself right now. Like I said I saved you for myself you see. My Sith friends all want you dead and even Prince Azak wanted you dead so I told them that I would kill you after I’ve had my way with you. I like you Lionette. I always have. I kept a likeness of your father so I would never forget what he took from me. In the background of the likeness was your image standing behind him, his first-born child. I began to look at your face more than his after a while. I’ve lived in these ruins of our once great house scratching my way back from the bottom to where I am today. After all these years I have you just where I want you.” Torbarr said. Lionette could hear the unmistakable hiss and click sounds of his heavy battle armor opening. She watched as he stepped out and onto the floor. Lionette tried to follow him around behind her with her eyes until she couldn’t see him anymore. After a minute or so she felt his hand caress her naked arm moving across her taught belly. His hand clenched tight on her nightdress as he tore it from her body. This wasn’t supposed to happen to her. She was a princess and a warrior. She was being molested like a common cat girl that had been dragged into the basement by the girl’s owner’s lustful son. It would happen and nothing would be done about it. His hands explored her body as she sat bound and humiliated. All she could think of is that this is what it must be like for them, the cat girls, but now it was her. She began to get mad and struggle against the bonds. Immediately there was another huge pulse of electricity coursing through her body as punishment for trying to resist him. She growled with pain and anger through the gag only to be shocked again and again. Longer and longer pulses of electricity met each sign of protest. She resisted each jolt of electricity knowing a longer one would come next. The only option left was to hope the electricity would eventually stop her heart and keep him from violating her. “That’s all for today I think. You’re going to be a tough one to break but I will enjoy every minute of your resisting and the pain you will receive by my hand.” Torbarr said grabbing Lionette’s hair and pulling on it roughly. “Tomorrow I will send my slave to give you some water. You won’t be fed until you obey me completely. Until then you will starve just like I did after the Great Maxis Ty took everything my father had.” He said releasing his grip. Lionette gasped for air through the gag relieved this session was over. Torbarr calmly climbed back into his heavy armor and closed it up tight. He turned and slowly clanked back out the door and up the stairway and through the door. Timtam and Hudd had finished their assignment for Pep on Geirgor. The girls were being well treated and had the best protection they could have. The girls still weren’t ready to find mates and settle down yet but there was still time and Timtam felt they would adjust quickly. Hudd had been bothered by the fact the sensors were acting funny. They seemed to flicker off and on for no reason. It wasn’t a big problem because the course they were on was a commonly traveled one. Hudd had been a pilot most of his life and had become a stickler for details when it came to flying spacecraft. Too many times had he heard of one tiny problem on a ship becoming a life and death situation. “The damned scanners keep blacking out. It’s almost like they keep reading the same signals over and over.” Hudd said frustrated. “What causes that to happen?” she asked. “Nothing does. It can’t happen. It’s like the area of space in the quadrant to our left keeps sending us the same signal it did ten minutes ago.” He replied. “Should we go and check it out?” Timtam asked becoming curious. “Better if we just report it. We’re all alone out here and this ship is too small to be getting into trouble with.” He said. It wasn’t so long ago that Hudd was almost killed and he didn’t want to risk Timtam’s or his life if he didn’t have to. “Let’s take a quick peek, just a little closer.” She smiled impishly. Hudd looked at Timtam’s grinning face full of adventure. “Okay, ten minutes in that direction then we turn around.” He said smiling back. Timtam giggled with excitement and swung the small scout ship in the direction of the anomaly. Hudd could see she was happy he agreed to her idea. He watched the scanner closely still smiling but also very worried. He was quickly having second thoughts about this little detour. He had a very bad feeling about this whole situation now. The tiny scout ship headed on its new course for the next five minutes without any problems. Hudd was looking at Timtam as she piloted the ship on this new adventure of hers. Suddenly her eyes grew large and the smile slipped away from her face. He looked to see hundreds of gold and black Feloid warships traveling in close formation. They were ships of the Visiok clan and they were armed to the teeth. In the center of this fleet was a huge ship in all white livery. It was an Imperial ship of some kind that mounted some kind of huge dish that revolved on its upper deck. The Visiok Clan must have made a deal with the Empire to overthrow the Ty Clan. Hudd grabbed the controls and fired all of the retro thrusters trying to stop the scout before they got too close. He hit the left thrusters swinging the scout around facing the same direction they had just come from. The proximity alarm began to go off meaning there were ships headed in their direction. “Hang on!” Hudd yelled as he pushed the throttle to maximum causing Timtam and himself to be pushed back into their seats. “I’m sorry.” Timtam said looking at Hudd teary eyed. “I said you could do it, it’s my fault too.” He said looking at his rear scanners. He detected two Feloid scout ships about the same size as the one they were in pursuing them. The two ships were beginning to match his speed and there was a good chance they would be caught. Hudd looked at Timtam. She was holding onto the seat tightly and crying. She new it was her curiosity that put them in this position. “Hey, you want to get married?” Hudd asked. Timtam looked over at him as if he had just lost his mind. “I’m a ship’s Captain, I can marry us right now if you want.” He said smiling nervously. He clanced at the scanners and saw the two scout ships were getting closer. “I’m in kind of a rush here babe, yes or no?” he asked summoning all of his bravery. Timtam was still looking at him in disbelief. “Yes.” She said finally. “I Kero Hudd take Timtam as my lawfully wedded wife.” He said. The first scout ship fired its weapon at Hudd and Timtam’s ship. “Timtam, do you take Kero Hudd as your lawfully married husband?” he asked as the impact alarm went off. Timtam looked at Hudd and wiped her eyes. The alarm was still sounding in their ears. She sat up straight and smiled at Hudd. Timtam reached over and took his hand. “I do.” She said. The weapon hit the small scout shaking the ship violently sending the small vessel tumbling end over end. Everything in the ship went dead. All the lights and alarms turned off as well as anything else run by electricity. They were now completely helpless. Timtam looked at Hudd who was turning knobs and switches without success. She grabbed him and pulled him close kissing him full on the lips. He kissed her back then pushed her away. His eyes darted about the cabin as if he could hear the enemy ships outside. They both sat quietly for a moment waiting for the next shot to finish them off. “An Ion cannon!” Hudd finally said happily. “They just knocked out our engines and generators. They know we can’t tell any one they’re here without power.” He said relieved. “What about life support? Do we have a solar sail on this ship?” she asked. She was becoming more and more familiar with ship equipment and emergency gear. “Yes it does. We’ll have to wait a while and make sure they’re gone before we deploy them. I want to make sure those bad guys are gone first.” He said. “How are we going to land the ship?” she asked. Hudd sighed. “That’s the trick. The solar sail will only power the life support systems. We’ll eventually pass by several planets but the ion pulse drained all the power including the batteries in the escape pod. The rockets would have to be rigged to ignite manually as well as the parachutes to make the escape pod work.” He said grimly. Timtam sat quietly for a moment and then became very exited. “I can do it! I know how that can be done. I really think I can fix it!” she said happily. “Are you sure?” Hudd never interfered with Timtam at work so he never thought of her as an engineer. “The igniters for the rockets only need a very small amount of electricity and we can charge the small batteries off of the solar sail then use the emergency manual release for the parachutes!” she said still amazed that she knew what to do. “My wonderful little engineer!” Hudd said giving Timtam a big hug and a kiss. Timtam pushed back away from Hudd for a second and looked him in the eyes. “Are we really married now?” she asked. “I’m afraid so baby. It looks like we’re in this together now for a long, long time.” He said smiling. “Coming dear.” Hudd said joking. Fey’s ship sat under a huge stone overhang at the bottom of the cannon. Even at night it was hot here. She was waiting for her bounty hunter. 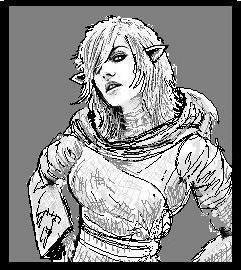 She had been tasked in finding the cat girl she had given the force accelerant too back on Gangler’s ship. Fey was a researcher and a scholar. She was not up to completing the task ahead of her alone. Through her various contacts and informants she had been able to make arrangements with a Feloid pirate Captain known to be ruthless. This was presently the exact type of person she needed. Fey sat on a rock looking over at her pilot who had been watching the scanners for any approaching ships. He shrugged his shoulders indicating there was nothing to report. Fey picked up a stick and began to trace Sith emblems into the sand. Unexpectedly a figure dropped down from out of no where and landed right in the middle of the tracings only two feet in front of her. Fey fell back onto the sandy ground shocked and tried to scramble backwards resulting in her becoming entangled in her own cloak. The figure seemed ten feet tall wearing a wind worn dusty cape. It also was wrapped head to toe in the rough garb of the local desert dwellers of the area known to be savage and on occasion cannibalistic. Fey threw her arm up in front of herself trying to gain whatever protection she could. “Who are you?” she asked in a more terrified sounding voice then she wanted to. The dark figure extended its hand to help Fey up without saying a word. She could see now that the intruder was much smaller than her frightened mind tricked her into believing. In fact this person appeared shorter than herself. Fey carefully took the hand and allowed the person to help her to her feet. Fey brushed herself off and watched as the person in front of her stood cross armed waiting patiently. Once the intruder saw that she had regained her composure she unwrapped the covering on her face revealing a very pretty Feloid face that held an unmistakable air of malevolence behind it. Her eyes projected pure evil and a pitiless essence. “I am Fey, are you the pirate Captain they told me about?” she asked shaken. “You can call me Enna. I’ve been waiting to get back into Feloid space and even some scores. With you backing me I think we can both get what we want.” Enna grinned. ” If you want someone to cause trouble for the Great Feloid race, well I was born to to that.” Enna smiled.